In 2008 I've earned my master of science degree in Applied Physics at the Delft University of Technology. Since I've always been interested in technology... in a very broad sence. From optics to solid-state physics, from nuclear technology to process technology (the bigger the better), from structural engineering to quantum-scale systems, from mechanical engineering to electrical engineering. I found that the only study that could give answers to all these questions was Applied Physics at Delft University of Technology. During the last few years, my interest in Physics has been very broad. From computational physics to solid-state physics to optics to nuclear reactor physics. For my masters, I have been working on Atmospheric Processes at the Multi Scale Physics group at the TU Delft. In this project a very subtle but important process called was entrainment is observed. Entrainment is the process were material is transported from the (stable) lapserate to the (unstable) convective boundary layer or mixed layer. This is the layer most close to the earths surface and plays a very important role in our daily whether. The rate at which entrainment occurs was considered to be well known, but recent research performed by my predecesor revealed that this very simple model seems to be invalid. My graduation project was to gain more insight into this (very subtle and easily disturbed) process and trying to derive a new theory for entrainment. It was highly experimental project. 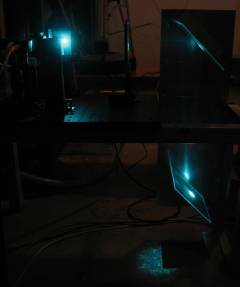 The techniques used to be able measure entrainment is Planar Laser Induced Fluorescense (PLIF). Using special image processing techniques we are able to measure the exact concentration of salt in our glass box with water.